“It was very gratifying for me to see so many people exposed to new instruments, music, and dances...”, said Anna Perea (Music Teacher, Adobe Acres Elementary School, Albuquerque, NM) about the Hi-Dukes assembly program at her school. 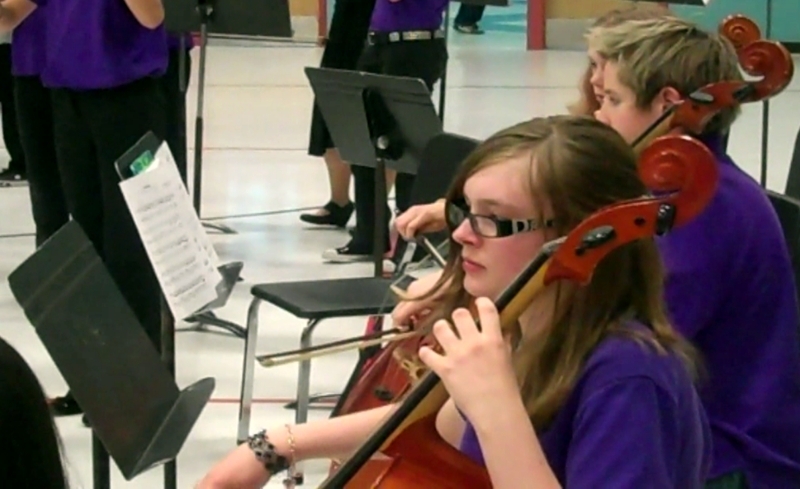 See the band in action on our video page! Awareness of the world, society, and history all increase when the Hi-Dukes introduce students to the traditional music and dance of over twenty cultures, such as that of the Balkan Gypsies. 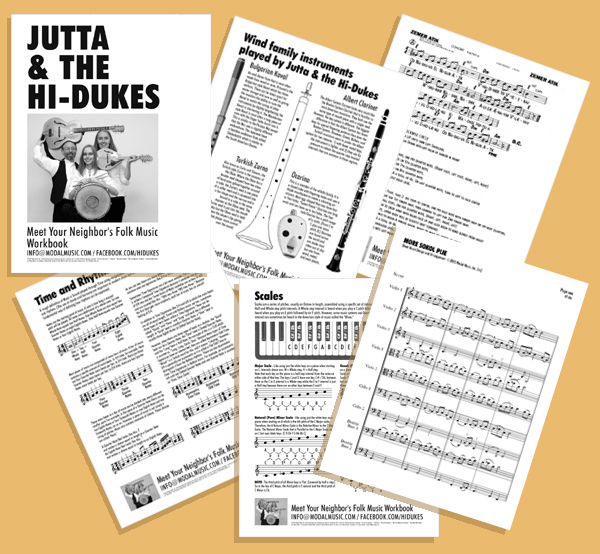 “Jutta and the Hi-Dukes provided a fantastic musical performance. The show was very student-friendly and informative. Allowing the children to participate through singing, instrument playing, and dancing was a wonderful way to integrate essential multi-sensory activities within the audience experience. Thank you, APS Fine Arts, for sending us the Hi-Dukes!” wrote Mist Miller, (2012 Acting Principal at Tierra Antigua Elementary School), in the December 2012 edition of Fan Fare, the Albuquerque, NM school system’s Fine Arts Department newsletter. Teacher Prep materials are available! Gorgeous musical scales like Hijaz and Sabach ride on the asymmetrical rhythms of the Balkans while the Hi-Dukes play traditional ethnic instruments, like the Bulgarian end-blown flute, Greek baglama, Middle-eastern drums, and world-famous ocarina alongside the violin, mandolin, and guitar. 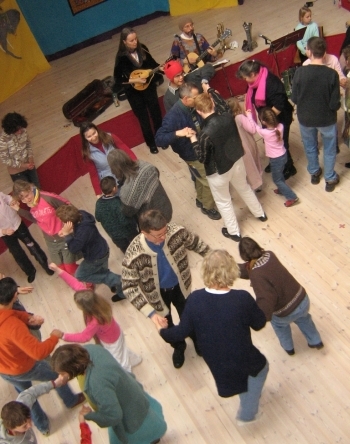 Students learn dances, sing simple songs in non-English languages, and drum along on the band’s percussion. Residencies / Workshops in many subject areas available. Flexible content focus and program length to fit your school’s needs and interests. Workshops allow for greater exploration of a subject, and can be focused on specific areas of interest. With a repertoire of about 400 melodies and 50 dances from over twenty cultures, the Hi-Dukes can be very flexible with what can be presented. A mixture of back-to-back Workshops and Assemblies, Residencies, Community Dances, and Afterschool events are all possible programming options. Call for details (847) 864–1022 between 10 AM and 10 PM C.S.T. Whether your school needs a group that can highlight your International Day activities or needs a program that focuses on a specific culture, we are happy to talk about how a Hi-Dukes presentation will enhance the educational experience of your students. Since 1990, this Evanston, IL band has toured in the United States, Canada, and Europe. Two members, Jutta Distler and Terran Doehrer, are teachers at the Arcturus Teacher Training Program for Waldorf schools and taught dance classes at the Chicago Waldorf School for six years. In 2003, LACONI YSS (Library Administrators Conference of Northern Illinois Youth Services Section) included the Hi-Dukes in their “Best of the Best” list. “It was happy, friendly, warm, and the kids loved participating. We succeeded in taking the children around the world, and we didn’t have to leave home.” So Mary Jo Ponce, then-director of the Chicago International Children’s Film Festival, summed up the Hi-Dukes music and dance program. Videos by Earth Star Graphics (tm). Web design, photos, videos, band names, company name, and text © 2013, Modal Music, Inc. (tm). All rights reserved. Duet photo by Wally Reichert. © 2003 Modal Music, Inc. Trio photo by Betina Distler. 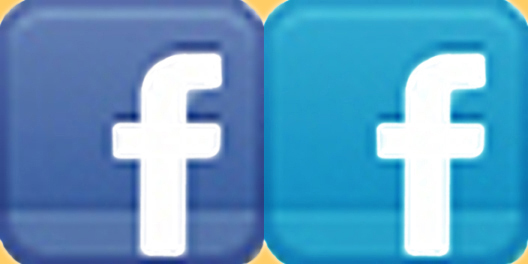 © 2012 Modal Music, Inc. All rights reserved. Quartet photo by Rumiana Shumanov. © 2009, Modal Music, Inc. All rights reserved. Quintet photo by Jim Godsey. © 2010 Modal Music, Inc. All rights reserved. Banner image of dance class © 2012 Modal Music, Inc. All rights reserved. All other photos, unless otherwise indicated, © Modal Music, Inc. Audio sound recordings and Video sound recordings (P) performance rights Modal Music, Inc. (tm). All rights reserved. “Modal Music, Inc.”, “Modal Music”, “Modal Music Records”, “Modal Music Market”, “Modal Market”, “Fine ethnic entertainment since 1988”, “Quality entertainment since 1988”, “Jutta & the Hi-Dukes”, “Jutta & the Hi-Duke”, “Hi-Dukes”, “Hi-Duke”, “Euro Roots World Music”, “Euro Roots”, “Balkan Gypsy Dixie Klezmer”, “Balkan Beats”, “Meet Your Neighbor’s Folk Music”, “Ethnorobics”, “On The World Beat”, “Ensemble M’chaiya”, “M’chaiya”, “Chicago’s Original Klezmer Band”, “Chicago’s Original Revival Klezmer Band”, “Trad Roots and New Beats to move the heart and feet”, “Trad Roots and Gypsy Beats to move your heart and feet”, “Terran’s Greek Band”, “Greek Music Beyond Boundaries”, “Old style acoustic Greek dance music”, “Nordland Band”, “Nordland”, “Warm music from cool lands to melt your heart”, “Two For Tea”, “Les Beaux Chemins”, “Balkan Rhythm Band”, “The Jazziest Balkan Dance Band Around”, “Razzemetazz”, “Swingin’ Pop From The Past”, “Swingin’ Songs From The Golden Era Of Pop”, “World Hillbilly Swing Band”, and “Globe Toddlers” are all trademarks of Modal Music, Inc. (tm). All rights reserved.